Madrid coach Zinedine Zidane says "it's not much, but he has something. So like always, it is better that he is out three or four days than hurting himself even more." 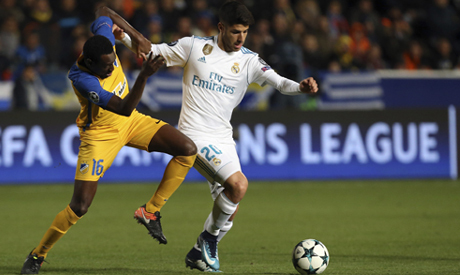 The 21-year-old Asensio has scored seven goals in 20 appearances for the European and Spanish champions. His four goals in the Spanish league make him the team's top scorer alongside Francisco "Isco" Alarcon. Cristiano Ronaldo has 10 goals overall for Madrid, but only one in the league. Madrid hosts Malaga on Saturday, needing a win to keep pace with leader Barcelona and Valencia. Barcelona visits second-place Valencia on Sunday.